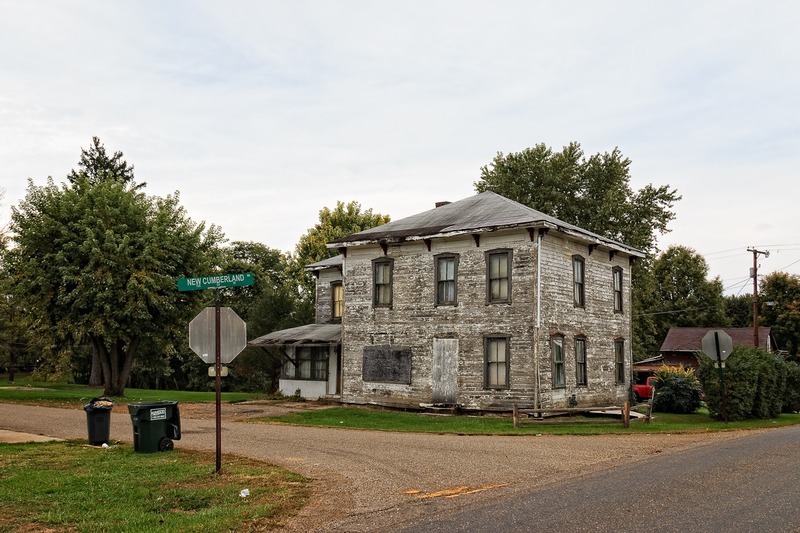 This is the second half of an excursion I took in October 2016 through a corridor of eastern Ohio that runs north from Cambridge up to Canton, Ohio. 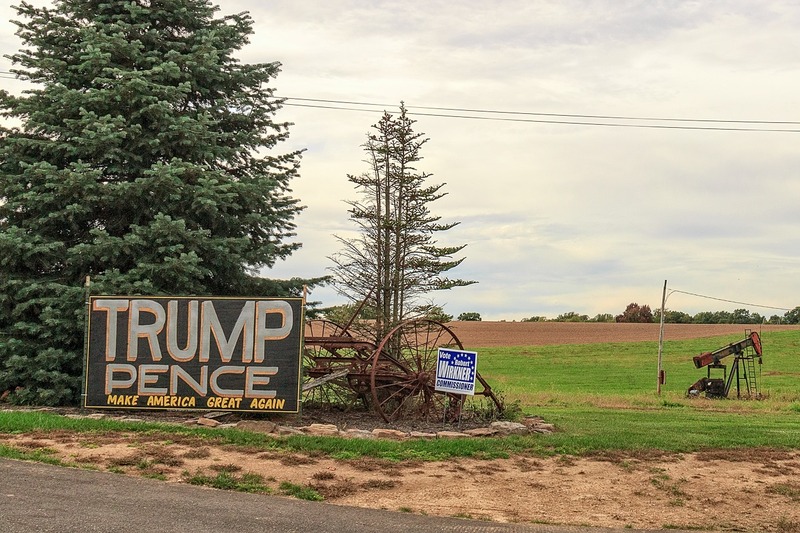 Only weeks before the presidential election, this area of Appalachian Ohio was strongly coming out in support of Donald Trump, as exemplified not only by a proliferation of signs but also huge handmade signs that were practically shrines to Trump. I documented such signs from this trip, and my next trip, in a blog post, which you may have read, but this blog contains the full excursion. My camera GPS cut out at me, as it frustratingly often does, but I can tell by the sign reading New Cumberland Road and my last GPS position that this photo was taken not too far east of the town of New Philadelphia. 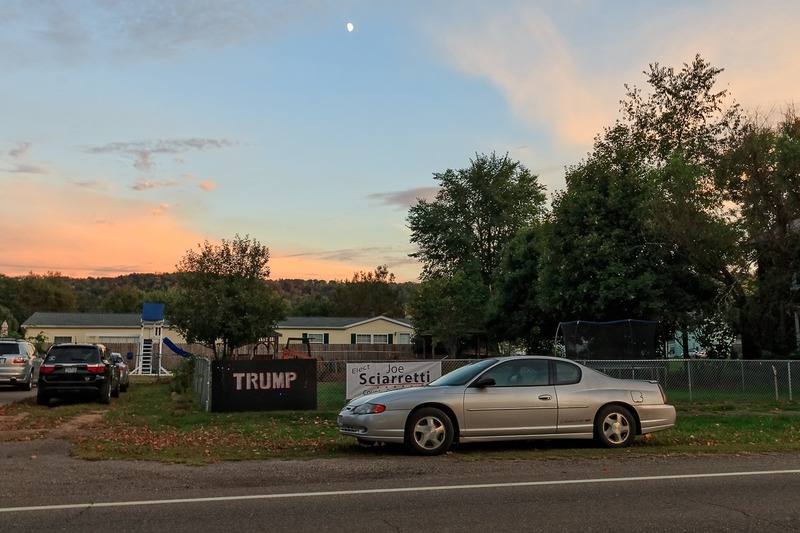 Here’s Appalachian Ohio in a nutshell: Oil and Trump. 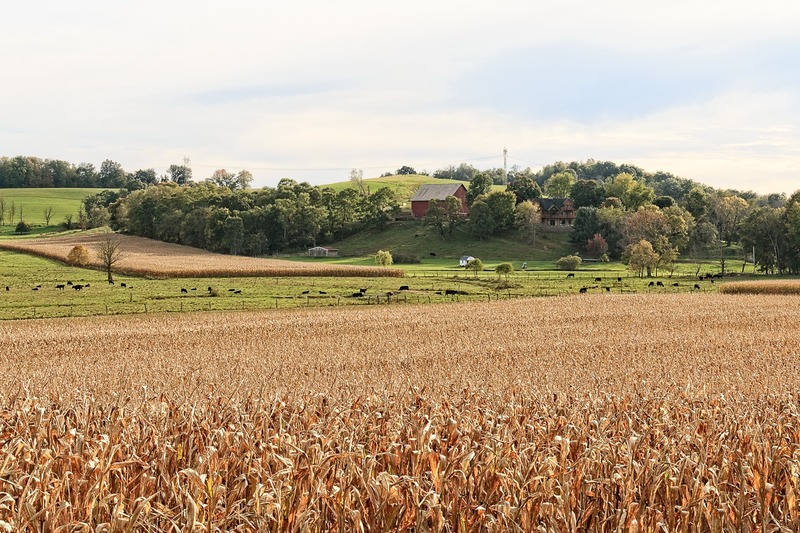 As one gets further north in eastern Ohio, the Appalachian hills begin to thin out, the terrain flattens, and farmland reappears. 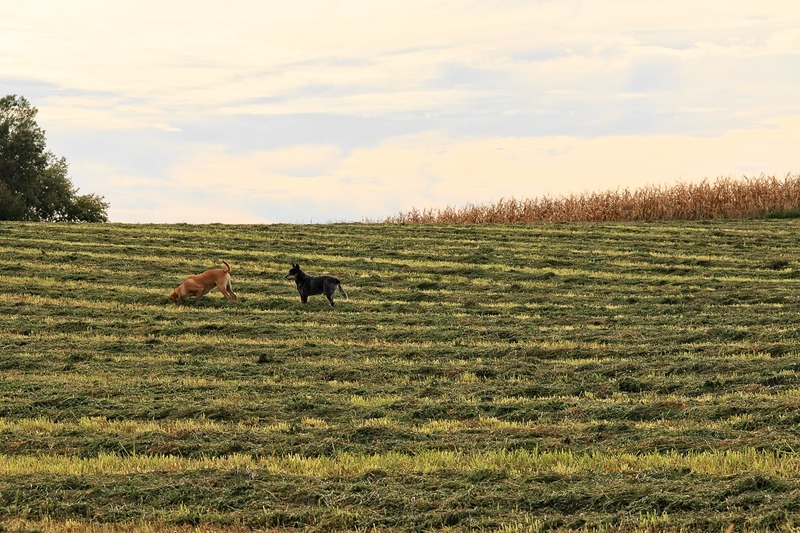 Here a couple of country dogs cavort in a newly-cut field. 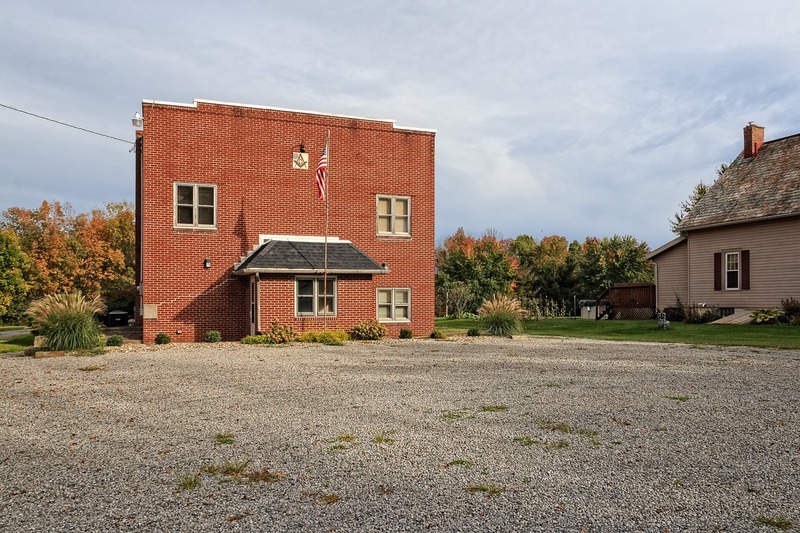 This is a small Masonic lodge building, erected in 1947, but without the GPS, I cannot place it. I used a lodge locator to try to look at all area lodges, but none of them seemed to be this one. If you recognize this lodge and can tell me its whereabouts, please let me know. Here’s a nice looking farm. This day began very overcast but the clouds thinned out as the day wore on and by the afternoon I was actually getting some sunshine. Here, from another angle further down the road, is the abandoned school bus and abandoned mobile home that appeared in the previous photograph. At last I can finally place something. We see here the Mt. Zion United Methodist Church (“Prayer…The Word’s Great Wireless Connection!” reads the sign). Now it turns out there are a kazillion Mt. 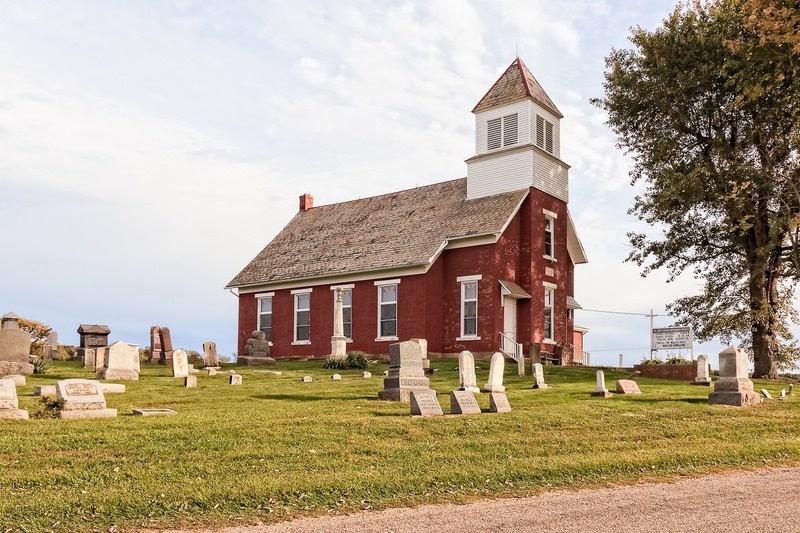 Zion United Methodist Churches, but only one with a Pastor John Carpenter, and that is the one outside of Minerva, Ohio, southeast of Canton. It is a nice country church, perhaps worth a second look, so I thought I would try and process the image a bit differently. This version is a bit more ethereal, which perhaps befits a church. 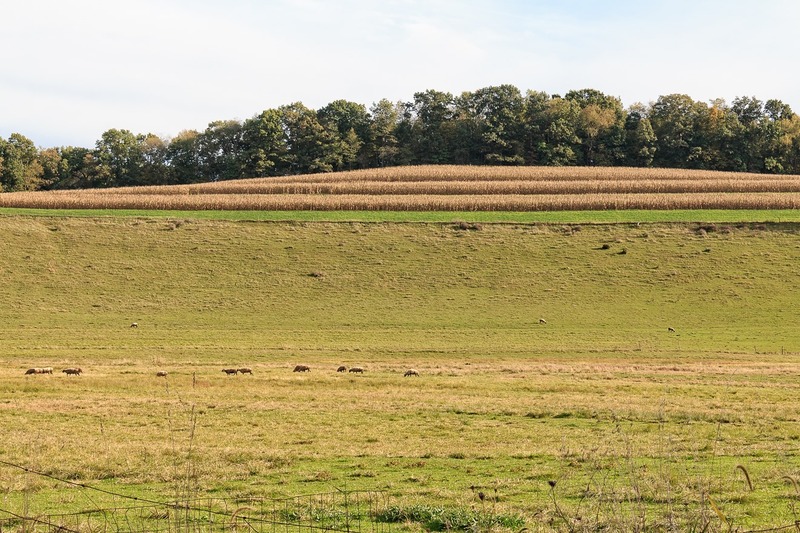 Here’s an example of a common practice in eastern Ohio in which farming is done in strips—typically long sections of corn alternating with something else, such as hay. When the hay is cut and the corn remains, you get an odd layered look (when viewed from the side). 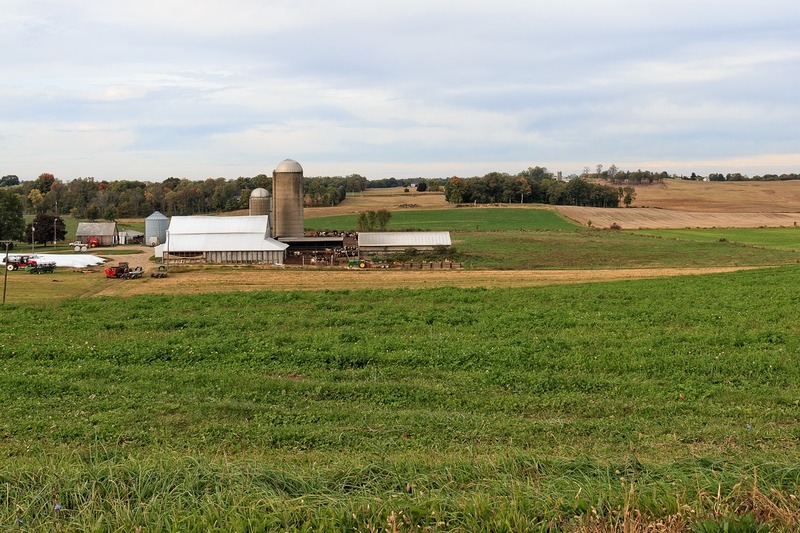 Farmland and pastureland in northeastern Ohio. 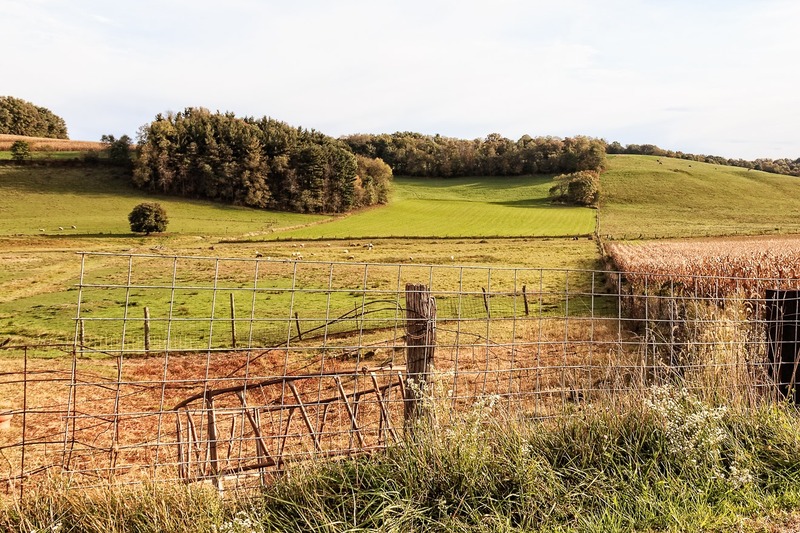 A juncture of four distinct fields. 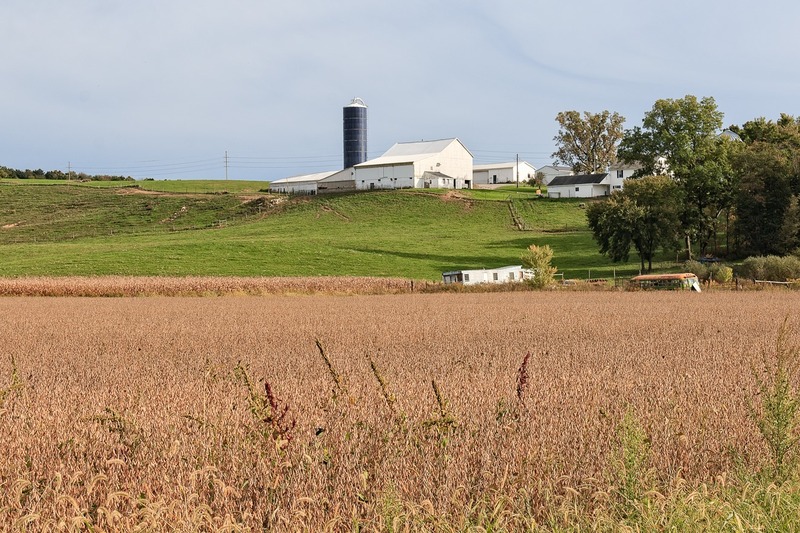 Now here’s a busy agricultural scene: we have fields and pastures and barns and farmhouses, oh my. 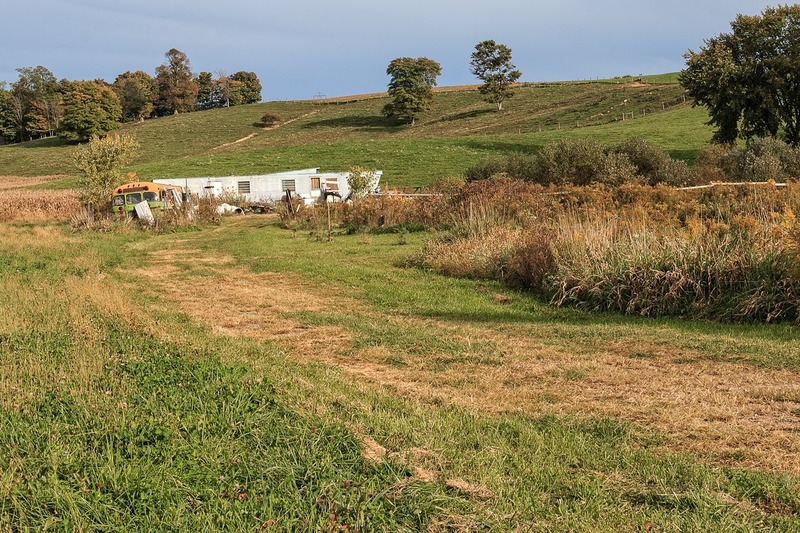 It looks like a well-kept farm. 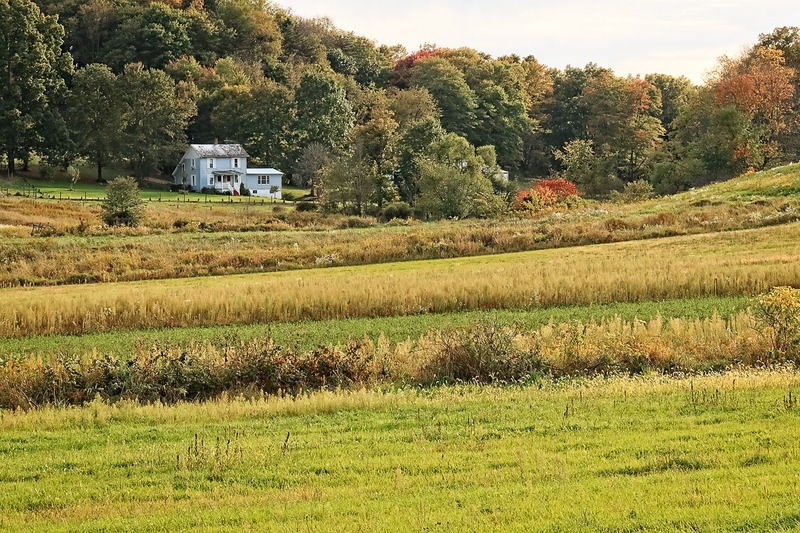 I like this little country farmhouse nestled in among the trees. This photo was taken somewhere between Minerva and Carrollton, but I can’t say where exactly. Carrollton itself is the seat of Carroll County. The village (population 3,241, salute!) 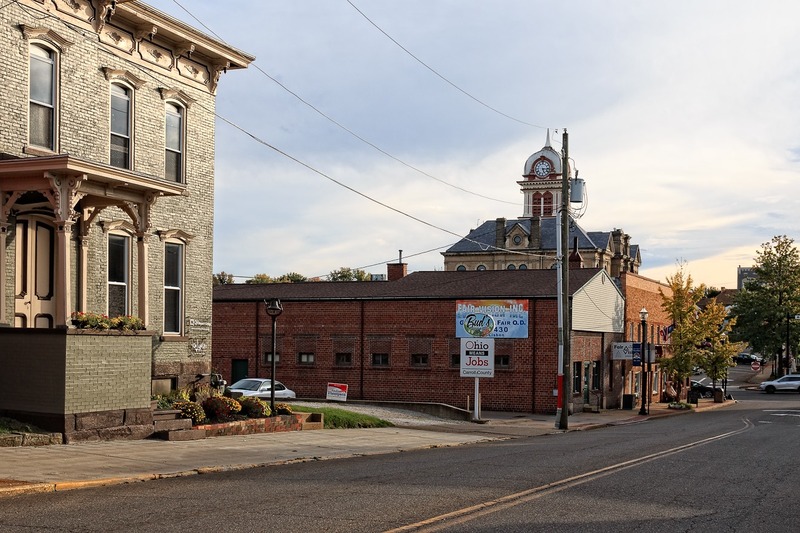 is an attractive village one county to the west of the Ohio River. 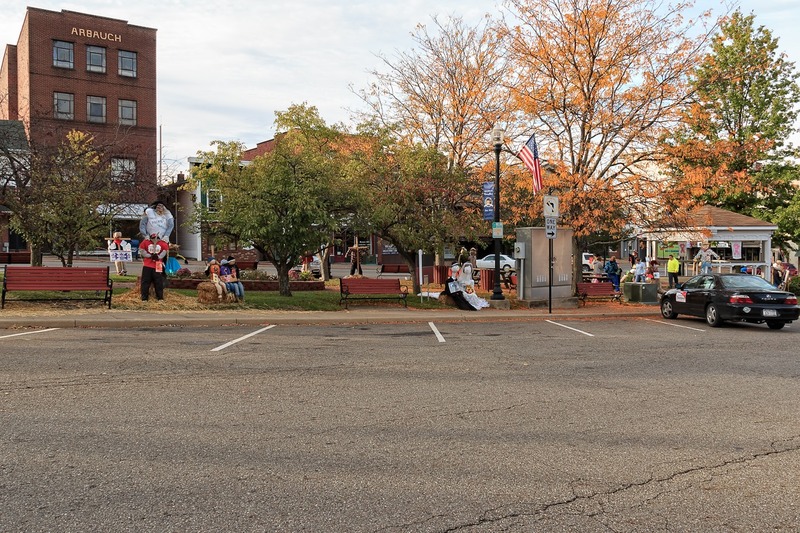 Unlike many places in eastern Ohio, Carrollton has seen modest growth over the past half-century instead of decline. It seems like a nice place to live. I visited it only a couple of weeks from Halloween and the town square was full of decorations. Like many places in Ohio, Carrollton bizarrely does not do trick-or-treating on Halloween itself but rather on some other random day. 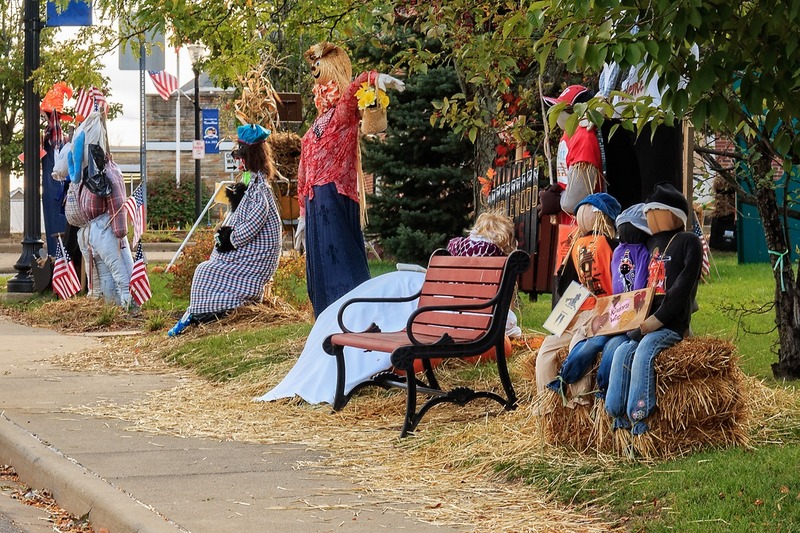 Apparently, in Carrollton, businesses and organizations erect little costumed exhibits at the town square for Halloween. 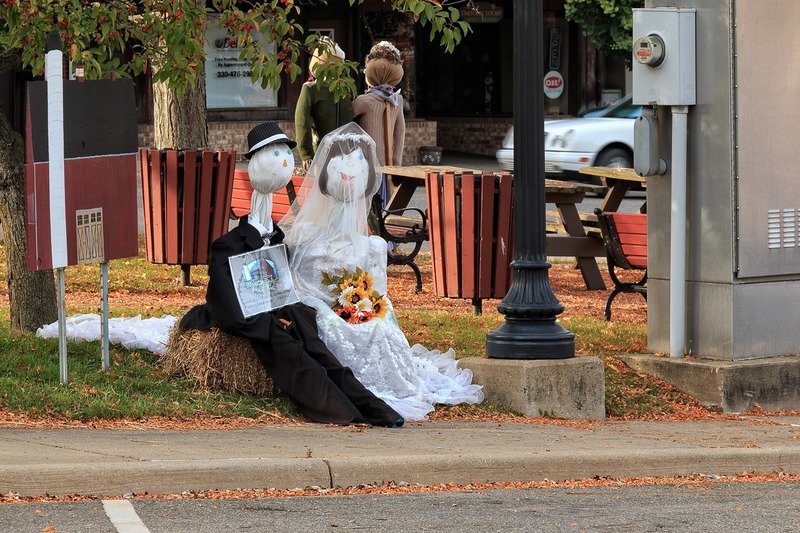 Here a ghostly bride and groom sit placidly—while doing a bit of advertising for Century Farms. Hell, let me do some advertising for them, too. I thought originally that Century Farms was, well, a farm, and it sold produce or dairy or some sort of agricultural product. 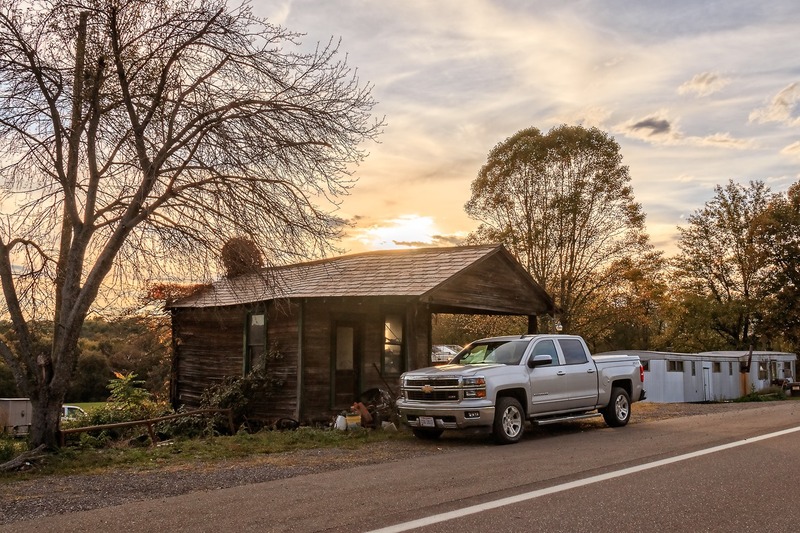 In reality, though, it is basically a “renovated barn event venue,” which in plain English means a large old barn that has been rebuilt specifically to hold events such as weddings, reunions, corporate events and parties. It also includes 5-bedroom villas and even a small hotel—all of which seem very attractive. You could do worse. Okay, Century Farms, I plugged you. That ought to be good for a free night’s stay or something, right? Now here we have a bunch of stuff. 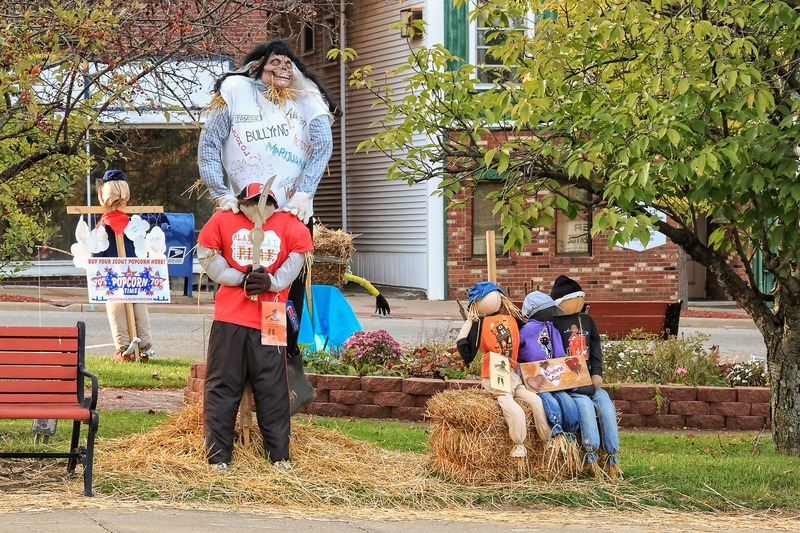 On the left we have some sort of figure (facing the other way, alas) who also happens to be shilling for Pecatonica River Popcorn, who want us to be aware that one can “get your Scout popcorn here!” Fair enough. On the right we have a trio of figures sporting a sign that reads “Kindness Wins.” However, I can’t read who has sponsored that set-up. In the middle we have the most interesting item—a tall, scary figure wearing a t-shirt with labels such as “tobacco,” “bullying,” “marijuana,” “heroin,” “crack cocaine,” ‘dating violence,” “alcohol” and “addiction.” The figure clasps the soldiers of a smaller figure—perhaps a child—who is wielding a sword on which is the word “No.” This figure wears a t-shirt with the acronym “P.L.A.Y.” on it, which it turns out stands for “People Leading America’s Youth.” This is an alcohol and drug prevent program at Carrollton High School. Here we get to see a few more of the figures. It was already quite late when I was in Carrollton, so I decided to pack things up and head home. I decided to drive south to U.S. 250 and take that west towards Columbus and home. However, on the way back, I saw something that made me pull out my camera—an ancient gas station, probably from the 1920s or 1930s. Unfortunately, I was either lazy or absent-minded or I didn’t truly realize how dark it had become. I took a few quick shots. I may have used the window mount but I didn’t really bother to set a long exposure or do any of the things I really had ought to have done to take a good low-light photo. The results were, I found out, crap, and it was only by dint of considerable effort that I was able to pull out even this half-assed salvage job, which I show here only for the intrinsic interest of the old filling station and not because the photo itself has any merit to it.